“Dirt under my nails with my city shoes on,” is how Vanya Goldberg describes her dual nature — a country mouse/city-savvy “chameleon” who has forged a career in social justice work focused on food systems. 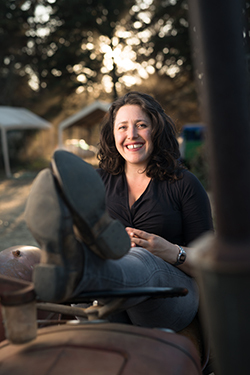 Goldberg has deep UC Santa Cruz roots: after finishing her undergraduate degree in Community Studies, she returned to campus as part of the 2008 Farm & Garden Apprenticeship, where she honed her organic farming skills. Today those dual skill sets combine to help immigrants make their way in a new culture and find places to create their own gardens. A self-proclaimed “child of intellectual hippie parents,” Goldberg grew up in Topanga Canyon—“the ‘country’ part of Los Angeles”—with home gardens, a love of good food, and an appreciation for farmers. “Any time we traveled, we went to farmers’ markets,” she recalled. Her mother was an early follower of Bill Mollison, founder of the permaculture movement, and her father developed award-winning landscapes featured in Better Homes & Gardens. With two sisters attending UC Santa Cruz, Goldberg was naturally drawn to the campus. She chose Community Studies as a major, focusing on sustainable development and working with professor Mary Beth Pudup on Latin American issues and anti-capitalist movements. Goldberg's search for a field study coincided with Russia’s withdrawal of economic support from Cuba and the “Special Period” of economic challenge that followed. In 1999 she began a year-long process of setting up her research, getting up at 4:30 am to touch base with international contacts. In the days before cell phones, “I ran up $1,000 phone bill in the process,” she recalls. During her 10 months in Cuba, Goldberg studied participatory community development—a focus that combined her love of music, dance, food, and farming—before returning to UCSC, where she graduated with honors. Her time in Cuba planted the seeds of a relationship that continues to flourish. Fluent in Spanish since her teenage years, she returns annually to lead educational tours and work with local farmers. San Francisco and the East Bay were Goldberg’s next stops following graduation, where she plunged into community organizing and education for youth programs, including a stint with People’s Grocery of West Oakland. In San Francisco she also discovered the Garden for the Environment, a community garden that teaches urban horticulture skills. “That was my first formal introduction to horticulture, and it was itself a mini-apprenticeship,” says Goldberg. 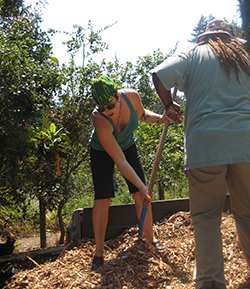 A permaculture program at Merritt College followed, along with the realization that farming offered a pathway to a healthier life. Those experiences would eventually lead her back to Santa Cruz, this time working and learning organic gardening and farming skills in the classroom, gardens, and fields at UCSC’s Farm and Alan Chadwick Garden as part of the 2008 Apprenticeship in Ecological Horticulture, a program run by the Center for Agroecology & Sustainable Food Systems (CASFS). By March of 2009 Goldberg was farming full time at Blue House Farm. The Pescadero-area organic farm was started by fellow Apprenticeship alumni Ryan Casey and Ned Conwell. “Ryan and Ned are great communicators and they were committed to education and really treated us with respect. It was a great experience, and it was the hardest work I’ve ever done,” she recalls with a smile. After farming and living in a yurt at Blue House Farm, Goldberg was ready to be back in the city. “I missed the dancing!" Once settled in Oakland, she worked on youth and urban gardening projects and as the State Outreach Coordinator of the Agricultural Justice Project, a program dedicated to developing a food justice certification for farms and improving the livelihood and treatment of farmworkers. And although she loved the jobs, she acknowledges the difficulty of making a living in social justice-oriented work. Today Goldberg’s work focuses on the needs of refugees and immigrants served by the International Rescue Committee in Oakland’s New Roots Program. The program’s centerpiece in Oakland is an intergenerational food justice internship offered through Oakland’s International High School, explains Goldberg. She also helps coordinate community garden connections and seeks out new garden sites for the organization’s beneficiaries to use, including a potential collaboration with the new community farm on the campus of Oakland’s Mills College. Goldberg keeps her hand in the organic farming world as a marketer at the weekly Berkeley Farmers’ Market, where she runs the farmstand for fellow Apprenticeship classmate Marsha Habib’s Oya Organics farm. “That physical abundance of healthy food that the market represents is something we need so much right now,” she says.